Why are Dreams Important to Health and Spiritual Growth? According to research on dreams, dreams are what help us make sense of the world around us. In dreamtime we are already problem-solving and dealing with current and future issues, no matter if we remember the dreams and issues or not. Intentional dreaming is about pro-actively tapping into this amazing ability we all have—but most of us just let run on auto-pilot. What is even more amazing is that we can intentionally tap into, work with and be inspired by the dreams for specific reasons—and our dreams seem to want us to do this. They respond to our questions and concerns and keep knocking at our door with repetitive dreams when we don’t want to respond. Dreams are sources of pure intuition. While daydreaming, prayer and meditation can give us intuitive insights, dreams are probably the surest and the best way to access intuition in its richest form. The famous neurologist and founder of psychoanalysis, Sigmund Freud, called dreams “the royal road to the Unconscious.” He was not the first to make a similar claim. Ancient cultures viewed dreams as a way that the gods spoke to humans. We only have to think of Joseph’s prophetic dreams and Jacob’s ladder dream to recall that the Bible is full of stories of holy and dynamic people being led by God through their dreams. 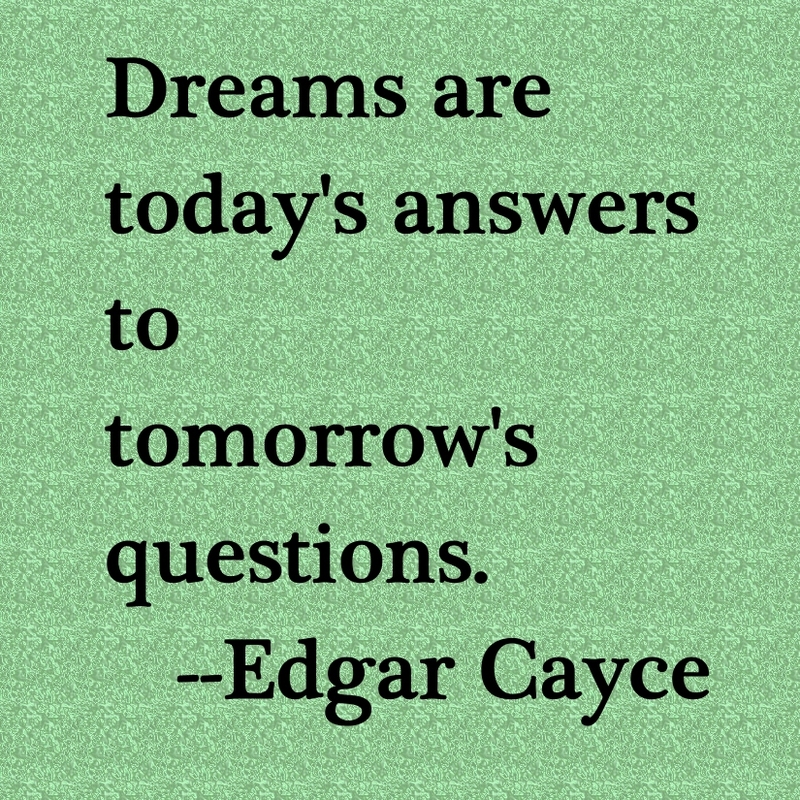 Edgar Cayce, one of the world’s greatest intuitive minds, said that dreams were “today’s answers to tomorrow’s questions,” and that working with dreams was important for spiritual growth. To not do so would be “highly negligent.” Edgar Cayce thought that the purpose of dreams was to align the dreamer with the soul’s purpose—something that is often quite different from Ego’s purposes which tend to be focused on things like making money or gaining status in the community. (Reading 2265) Dreams then are one of the best ways for connecting with the true nature of one’s Self for the purposes of healing and direction. From my experience, I have found dreams provide clues that are symbols for energy in the body, mind and soul. Dream elements such as images, themes and processes are the language tools used to communicate the health status of body, mind or soul. Learning to recognize the symbols for disease, health and well-being can, therefore, greatly aid us in learning at the energy level what the body, mind or soul wants and needs to be healthy—often long before something registers as a recognizable or testable medical or psychological ailment and before the time when something becomes a challenge to treat. Engage your dreams and let them inform you about how to better improve your health and well-being! This entry was posted in On Dreams, Uncategorized and tagged dream healing, dreams and health, dreams and spirituality, dreams and the soul's purpose, dreamwork, Edgar Cayce, healing dreams, intentional dreaming, pro-active dreaming, prophetic dreams, Sigmund Freud, significance of dreams, working with dreams. Bookmark the permalink.